So does ram damage taken into account before or after the attack. 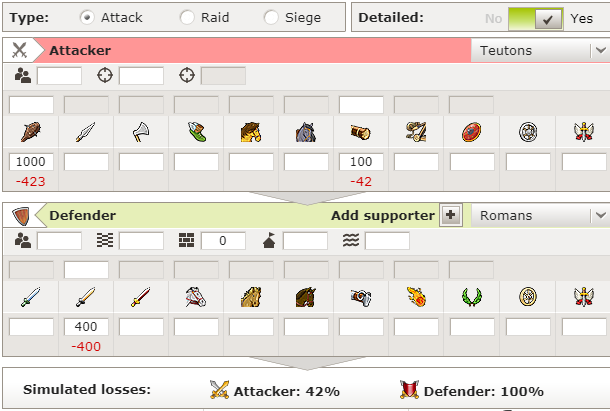 Say there are 100 legions defending with a wall at 10 against 100 imps with 50 rams. For scenario's sake, lets say 50 rams takes out the lvl 10 wall. Will the wall be destroyed prior to the battle denying the def bonus or after the stats have been input for survivor-ability of the off army? The actual ramming mechanic is that first there is a simulated raid played out and then based on the raids results the remaining rams do their damage first time and this wall level is used to then determine the actual results of the battle. Basically what this means that even if the wall goes down to 0 it can still have some impact vs not having the wall there at all but at the same time if the force difference is sufficiently large even lvl 20 wall could be reduced to 0 in that simulated raid phase which means the actual battle is fought at wall lvl 0. Compare above to below where the wall is removed, in both cases the end result is lvl 0 wall but the difference in casualties is big so the wall is clearly doing something. So basically if the off force is not overwhelmingly large enough to defeat the def in a simulated raid, then the wall has significance impact on the end result? Yes if offense is somewhere in the same ballpark then wall should have an impact even if it goes down to 0 in the end. That being said the later wall levels are lot tougher so if you can only get it to 15 or 10 then that reduces the amount threshold where offense is so big the wall doesn't matter. Also it's not about "enough to defeat the defense" rather it's about "how many rams survive the simulated raid". This is why ram count is very important because in big defenses the raid might only let a very small percentage of your rams to actually hit the wall. You can play around in the simulator with different force levels and different amount of rams and different wall types and see how it all stacks up. So long as the enemy isn't overwhelming the wall should boost your defenders power up so it's quite good building for every location you seriously intend to defend. So when you say raid, does that mean normal attacks act like raids then? No normal attacks don't act like raids, the raid phase is entirely simulated and only used to determine the wall level for the actual fight. It's what allows rams and catapults to do damage even though they all die during the attack. Normal raid doesn't allow rams or catapults to do damage at all.